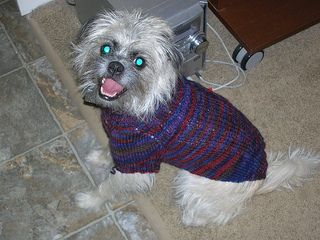 With an incredibly stylish and ‘macho’ feel, the BucaLicious sweater is a dream to knit in a wool self-striping yarn. The design requires only 2 x 50g balls of yarn (with plenty left over! ), making it a quick knit in a mixture of stocking and easy ribbing (in addition to the fact that you can indulge in some lovely luxury fibres!). 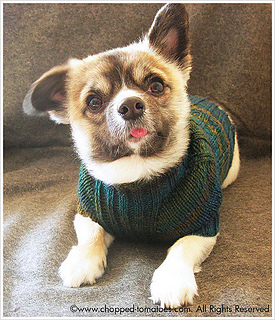 The pattern is suitable for a beginner who wants to try their hand at knitting in the round, and presents a chance to experiment with eyelet increases.To fit small to medium sized dog; neck 24-29cm, chest 37-47cm, back length 26-30cm. 30th March 2009 : Fellow Raveler found some typos in the pattern (thank you michelle! ), so the new pattern is now available for download. 24th January 2012 : More typos and stitch count mistakes updated. New pattern update available.